I suppose, after almost ten years living in Korea that you begin to take things for-granted. With the arrival of summer and many teenagers wearing skin-tight, knee-length shorts, I’d forgotten just how skinny so many boys are. And to compound matters, I’ve just returned from the UK where every other teenager is a lard-arse. Statistically the average Korean, weighing around 124 pounds, is one of the lightest in comparative world statistics. The current average weight in the UK is 152 pounds. Despite this, Koreans are gaining weight quicker than most other nations and I’m not surprised because western style junk-food has invaded Korea at every level. It is fairly common knowledge that once a food store opens in a neighborhood, that over time the average weight of people in the immediate area increases. Well, in the last year the block on which I live, which previously had one MacDonald’s and one Dominoes Pizza, now has four more western style junk-food outlets. Yes, you read correctly! Four! In less than a four-minute walk I can pass two MacDonald’s, a KFC, Lotteria and a Dominoes Pizza. And unlike the UK, every one of them delivers to your door. The newest MacDonald’s, actually directly in front of my one-room, is open 24/7. And with the block itself and the blocks immediately around it housing around 10 private academies, you can imagine that everywhere I look I see Korean kids stuffing burgers in their faces. The trend for western style food is just as voracious in supermarkets. My local E-mart, four minutes walk from my one room and also housing a MacDonald’s, now has cooler cabinets filled with microwaveable pre-made meals. Food I cooked 8 years ago, such as numerous fish stews where you bought a pack with all the fresh ingredients, squid, octopus, live shellfish, tofu, vegetables and a packet of spice paste, (and this is only one example) have disappeared and now the same cabinet contains a wide range of ready-made stews and soups in plastic packets. And there are totally new additions: curries with nan bread, racks of ribs, packs of Peking duck. Even one of Korea’s most cherished soups, and one of the easiest to make, samkaetang (ginseng chicken), has been conveniently packeted. Meanwhile, in small convenience shops I can buy chocolate that wasn’t in Korea ten years ago. Some 8 years ago in the UK several chocolate manufactures were being criticized for producing the most enormous bars of chocolate. Bars which in my childhood were 3-4 inches long are now 5-6. Mar’s and ‘Snickers’ were examples of the sizing-up of confectionery. I don’t know what happened about the debate but I do know that not only do you only ever see the super-size bars in the UK, but Snickers is now available in most Korean ‘corner’ shops. Then there’s the size of meals – now, don’t get me wrong, I’m a glutton, I love eating and I can eat lots but when I now return to the UK I’m staggered by portion sizes. I do once remember shocking some Koreans buy buying the entire family of five a pot of ice cream each in Baskin Robbins, something they considered outrageous. It wasn’t even a big pot but the smallest dinky one, probably containing one scoop. I’m used to eating between 5-7 scoops on my own and I don’t consider this particularly gluttonous. Koreans will share a five scoop pot between as many people able to sit around the table. In the UK, a normal size portion of cod and chips would feed a Korean family. The cod, always a foot long, hangs over the edges of the plate and the mountain of chips, piled on top cascade onto the table. Indeed, there are usually so many chips they tumble off the plate and if you add a roll, mushy peas and curry sauce, not only can you enter calorie-overload but need another plate. Actually, it would be easier to eat British size fish and chips from a bucket! Over the years I’ve often written about the absence of fatties in bathhouses! Well, they have definitely arrived and I usually there are people proportionately fatter than me and often they are kids. While many kids, especially boys are super skinny, a growing number are pudgy, soft and in the bathhouses and naked usually look like pillows. Red bean paste filled bungoppang. In this case, and uniquely, its crab rather than the traditional fish shape. Far less calories than a mega-Snickers and with some roughage. Meanwhile in the UK the weight-debate is almost exclusively perceived as a problem concerning individuals who are always deemed lazy, lacking will-power, emotionally weak while the solutions presented are mostly more of the same guff, new diets, exercise, changes in lifestyle, etc. Watching the fattening up of Korea it becomes very clear the process is deeply rooted at a social level and is about the food fads we buy into via advertising. Gary Linneker for example, a famous UK footballer, spent years advertising Walker’s crisps (potato chips) to youngsters and many high-profile celebrities, often sporting icons, advertise beer and soft drinks. And of course, both MacDonalds and Coca-cola advertise through major sporting events such as the Olympics. Then we have to consider the effective of Hollywood and the constant barrage countries like Korea face when American (western) cultural values are constantly pedaled It was only 10 years ago in the UK that the government sanctioned candy companies producing coupons on bars of chocolate that could be used by schools to buy sporting equipment. Oh, and then there was that insidious chemical refreshment Sunny D, that swept through the UK the coupons of which supplied school basketballs. I often find the morons who perceive weight gain at a predominantly individual level, and who constantly harp on about personal choice and discipline, a little like those who blame the rise of breathing-problems on the fact individuals choose to breath rather than on the increase of pollutants in the atmosphere. 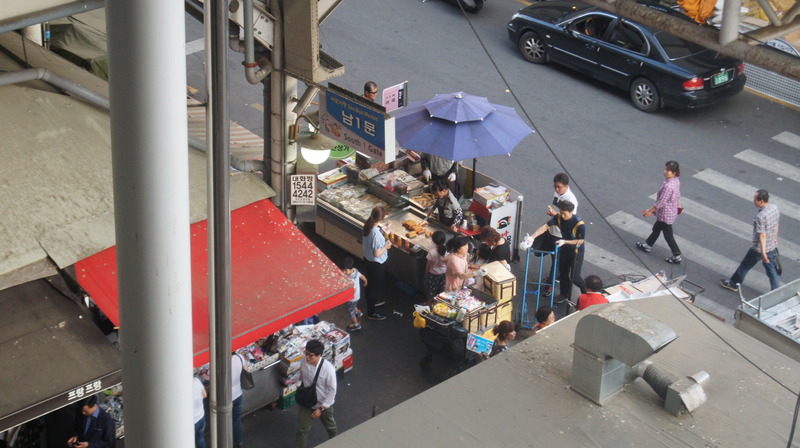 Of course, Korea has its own fast-food, known as minute-food (boon-shik) but much of this isn’t actually that unhealthy. I wouldn’t put bibimbap and kimpap in the same league as pizza and hamburger and much street food, minute food, is sold in small portions and are snacks rather than meals. 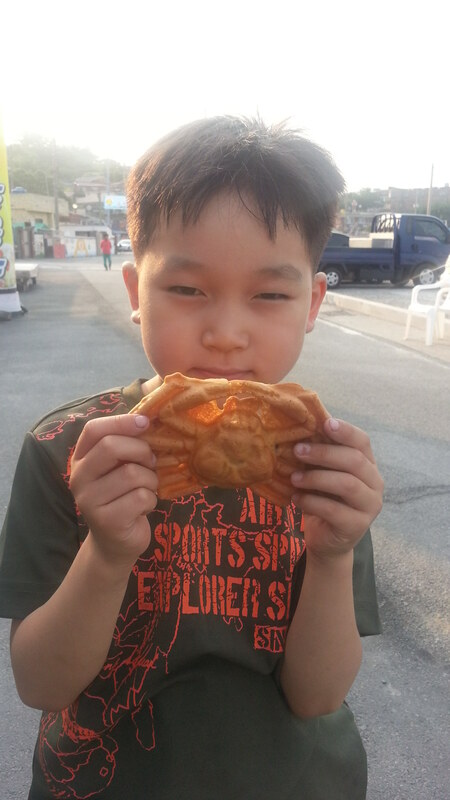 In the Korean street where one is never far from a street vendor selling the likes of odeng, and bungoppang, the cost of food is much less than that of western-style fast food places. Despite this, the big fast-food franchises are never empty. Unfortunately, as Korea becomes increasingly westernized we have to acccept ever increasing waist-lines. Hey, Charles, hope you are well. Thanks for the comments. Hey, nice to read another update. But why aren’t there any more? I would like to read more about further bath house experiences. Which one are the best in Seoul and Busan? I’ve just been busy on another project which is now finished. Plus, I moved back to the UK. I don’t know about best bathhouses in Seoul or Busan. Seaoul of course, is famous for Dragon Spa but I’ve never been there. There is also a famous bathhouse in Busan I mentioned somewhere which as an open roof top area. Good luck.